Two things my kids love? Both are wonderful sensory experiences. 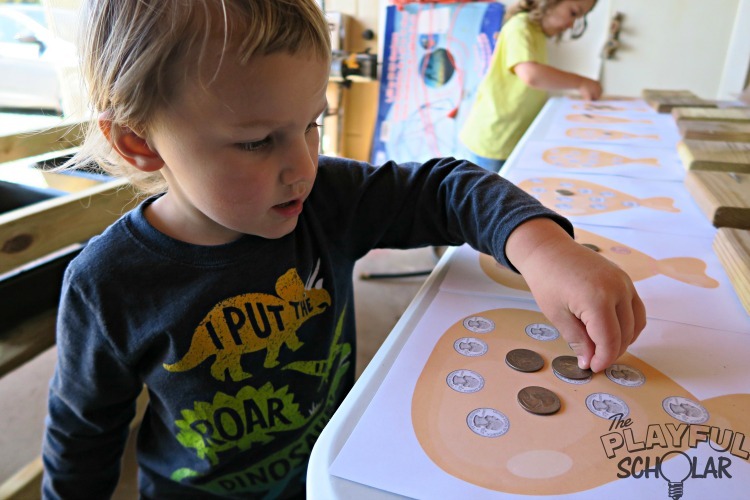 Learning to recognize basic coins and how to tell them apart are huge steps toward beginning to understand money and commerce. 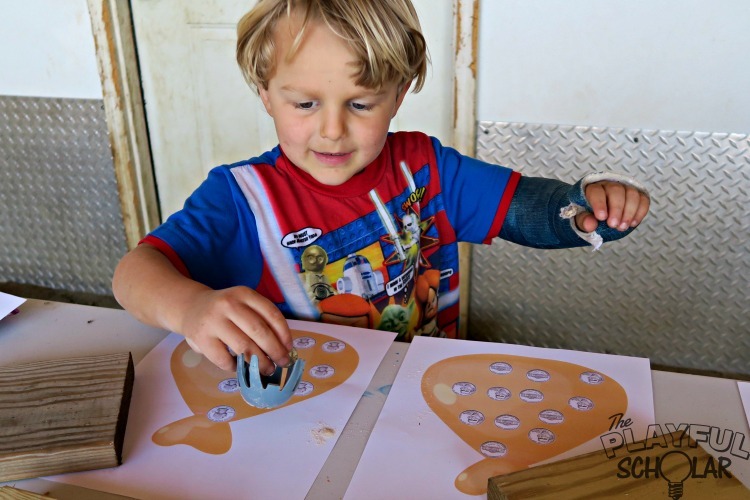 This activity develops scientific reasoning and fine motor skills. 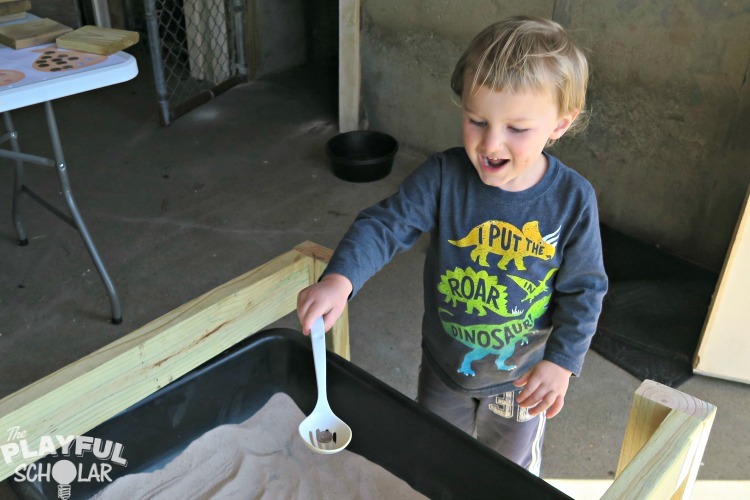 The kids dig through sand to find their coin treasures. 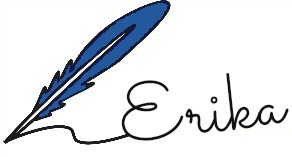 Then they determine which coin they have and place it on the appropriate outline. 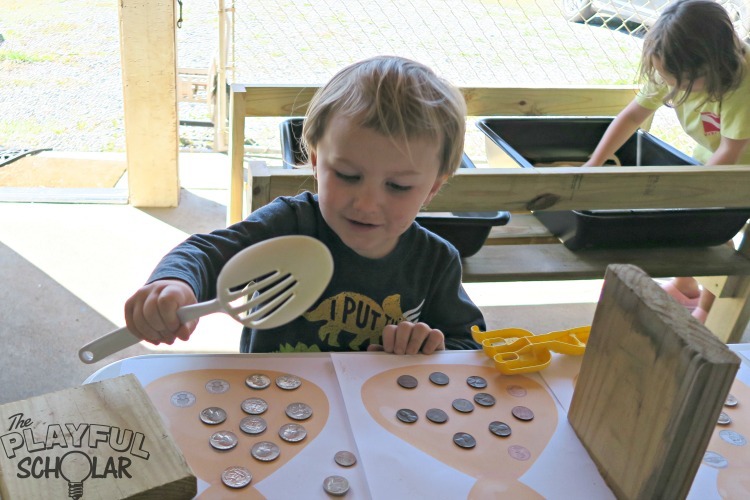 Since there are twelve of each coin hidden in the sand they also get to keep track of how many coins they have found and how many more are still hidden. 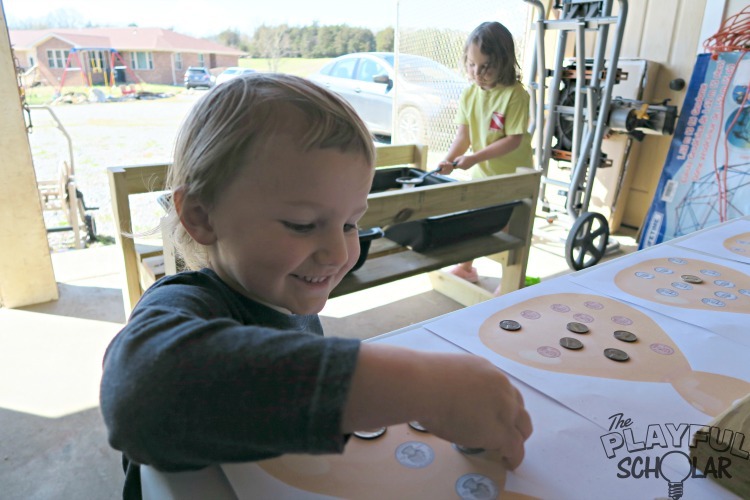 I love hearing them announce, “Mom, Mom, I found all the pennies!” It’s fun for all of us! 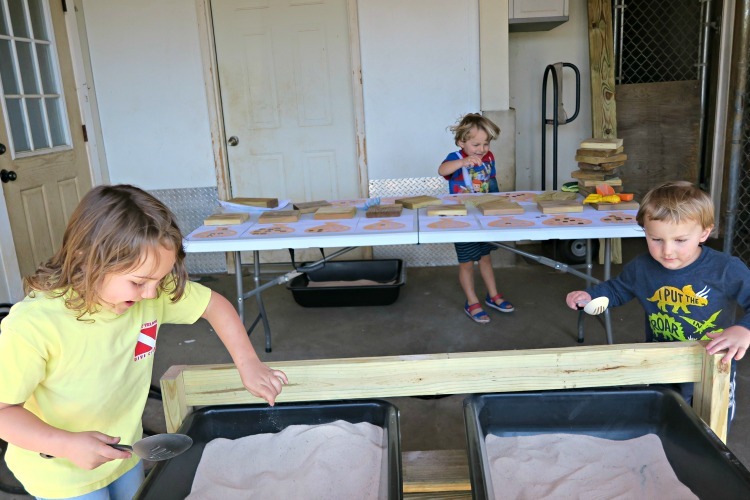 Fill a tray or tub with sand. Set out different tools (brushes, tongs, slotted spoons) to move and sift the sand. 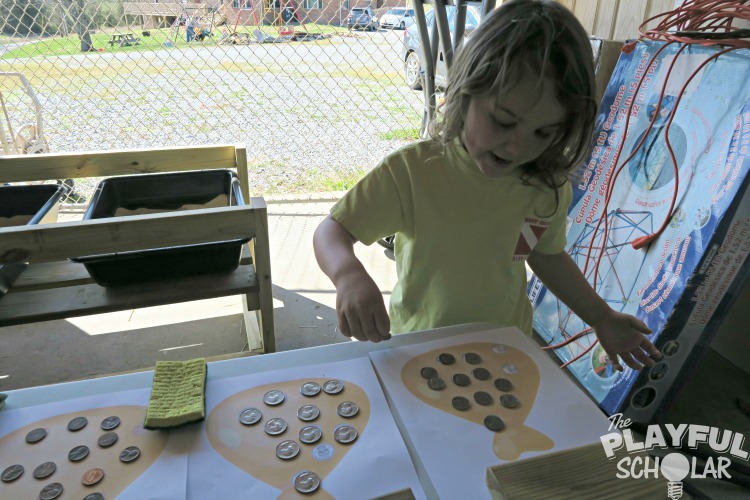 Label each sheet of paper and then trace around 12 of each coin. Then hide 12 of each coin in the sand. Note: Each printable “Coins in a Bag Sheets” contains 12 of each coin, but is editable in case you wish to delete or add some coins. 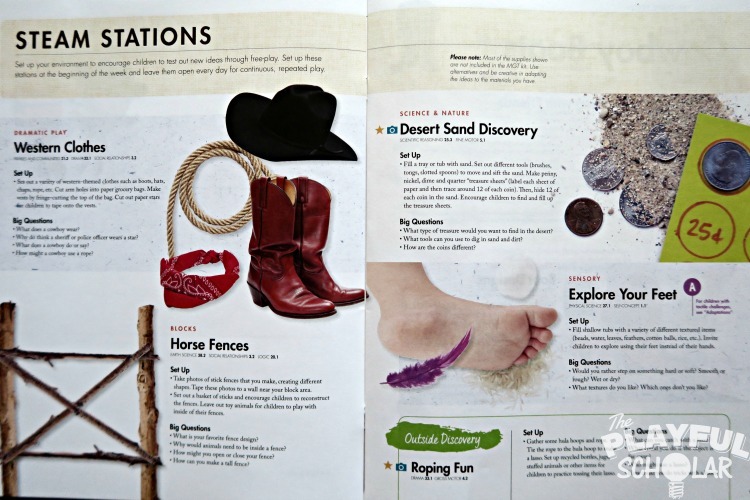 Encourage children to find and fill up the treasure sheets. 1. What type of treasure would you want to find in the desert? All three of my kids announced that it would be fun to find coins and money in the sand. They also offered up things they have found in the sand on the beach in the past such as part of a boat, shells, old jewelry, and even a left behind toy or two. As a true testament to us reading tons of books about the desert this month, my boys suggested that water would be a pretty darn good find in the desert. My daughter was quick to point out that although water was great treasure, it was unlikely to be buried in the bins. I love being a fly on the wall for these discussions! My kids were thrilled to discover there were real coins hidden in the sand! 2. 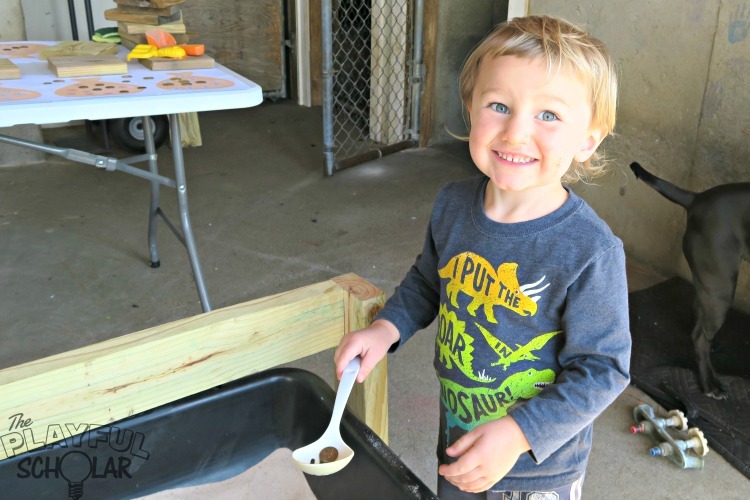 What tools can you use to dig in sand and dirt? 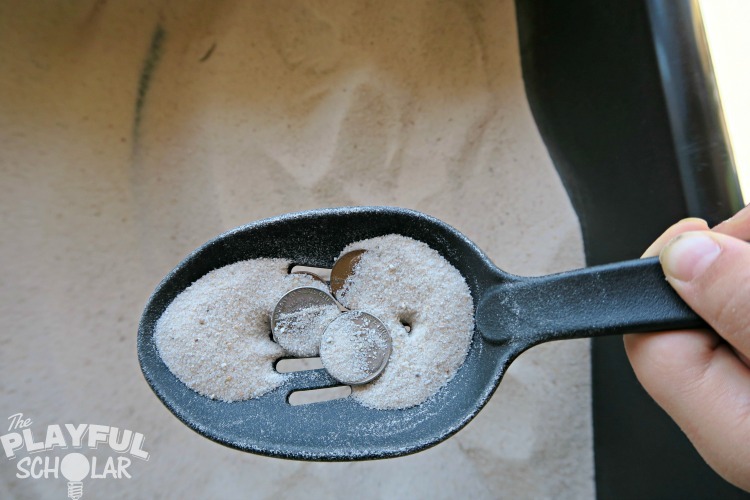 My kids love using slotted spoons to dig and sift through the sand. They are most likely to just use their hands. Brushes are quickly discarded, because they prefer to just use the coins with sand on them or brush it off with their hands. My kindergarten kid is a big car fan, so his toy diggers also made an appearance! 3. How are the coins different? Did you know that a dime is smaller even though it is worth more than a penny or a nickel because it was originally made with silver, a more expensive material? This is fascinating stuff folks! I won’t ruin this one for you. Go ahead feel the edges. The kids came up with this one without me and it’s totally true!!! !